Smok Minos 25mm Sub Tank Review - Daily Vaping Deals & The Best Vape Product Reviews at Vaping Cheap! There has been a popular trend lately where subohm tanks have been including RTA decks. This is definitely a great direction tanks are going towards, as it gives these atomizers versatility! If you wanted to just fill the tank and vape with a replacement coil head you can. However, if you feel like or prefer a coil that you build, then you can just install the RTA or RBA section. Even though not all subohm tanks will include an RTA or RBA section, it definitely is a pro to any tank that includes one. Even if a subohm tank was not to come with one, having one at least offered is definitely an attraction for any tank. This leads me to the product that is being reviewed today, the Smok Minos 25 Sub Tank. Firstly, I would like to thank Gearbest for sending this product my way for the purposes of this review. Smok has been releasing tons of new products lately, and many of them have been impressive. I will go over what I liked and did not like about this atomizer, and will conclude by stating whether or not I recommend this tank! Click Here to Check out the Smok Minos 25mm Sub Tank! The first thing I noticed when I received this product was the packaging. It seems like Smok is going with the same type of theme with their packaging, where it is black and displays the product or some sort of label in the middle of the front of the package. In the top left corner it states the company name “Smok” and in the bottom right hand corner of the box it states what product it is, in this case “Minos”. However, it does not state right on the front that this is the 25mm version. To be honest, the packaging is quite large for a subohm tank. Usually, I am used to much smaller packages when it comes to tanks. On one side of the packaging it goes over some of what this kit includes, which is the 0.3 ohm Minos-Q2 Sub Ohm Core, and the Minos M2 RTA Deck. On the other side, it has some QR codes, and information about their app that is available for download. Also, you can donate 10 cents in your name by doing so it seems, which is definitely a pro. I think vape companies who support advocacy is definitely a huge pro, so a big thank you goes out to Smok for supporting vape advocacy. On the back of the packaging, it goes over everything that is included with this subohm tank. What is included is the Smok Minos Sub Tank 25mm, one 0.3 ohm Q2 Core which is pre-installed, one Minos M2 RTA Deck, an allen key for this RTA deck section, a replacement glass tube, a user manual and spare parts. In addition, there is an introduction, a legal disclaimer and some warnings listed on the back. Upon sliding out the box, and opening it, reveals the Smok Minos 25mm Sub Tank. The first thing I noticed was how small it was for a 25mm tank. Of course, it is a bit wide due to its diameter, but compared to other 25mm tanks, it is pretty small in comparison. In addition, I really love how this tank looks. With its compact size, and overall design it just looks great. Underneath the tank is where everything else that was mentioned previously is located. There is quite a lot that comes with this tank. However, I do wish an additional replacement coil head was included, but I can understand why it did not include one, as it does include an RTA deck section. I do have to say though, everything was packaged very nicely inside. Not to mention, everything seemed very secure. This is a huge pro, as some products that I receive sometimes come loose in the packaging, or just have parts just laying around underneath the product with no protection. To me, this all adds to the presentation of the product, and like said in my other reviews, a good presentation is definitely a huge pro in my book! Going back to the Smok Minos 25mm Sub Tank, it came extremely clean. There was literally no smell of machine oil anywhere in the packaging, the included extras or the tank itself. This was a huge pro for me, as I do hate it when an atomizer comes and it’s drenched in machine oil. Washing machine oil off an atomizer is just an extra step that really isn’t needed when you buy a product. However, I always recommend you to at least wash out any atomizer once when you first receive it. All the threading was also very smooth. There were no major issues with the threading, and everything was of great quality. I am still impressed by the quality of products coming from Smok and other Chinese companies, as they’re just getting better and better, which is definitely a huge pro. You can check out my review right here of the Smok X Cube Ultra that we recently published, where I do mention once again how impressed I was with the quality of Smok. Also, this box mod is definitely a good match with this tank! You can also click the link down below if you are interested in reading that review! Click Here to Check out the Smok X Cube Ultra Review! The drip tip is delrin which was another pro, as I do prefer delrin over stainless steel for my drip tips. However, this is subjective and you may prefer stainless steel. It does state that the included drip tip is a 510 drip tip, so you can use your own preferred 510 drip tips if preferred! By the bottom airflow, there are two different words that are present. One is “MINOS 25”, and the other is “CRETE KING”. I have no idea what “CRETE KING” is supposed to mean or symbolize for this tank, but if you do know please leave a comment and let us know! Speaking about airflow, there seemed to be a good amount of it. The bottom airflow holes are not huge by any means, but comparable to other subohm tanks. The airflow control ring was relatively easy to adjust, which was another pro for me. Overall, my first impressions of the Smok Minos 25 Sub Tank was all great. This subohm tank just looks great, and had excellent build quality. All the extras that are included just add onto its great first impression. In the next section, I will go over building and wicking the Minos M2 RTA Deck. 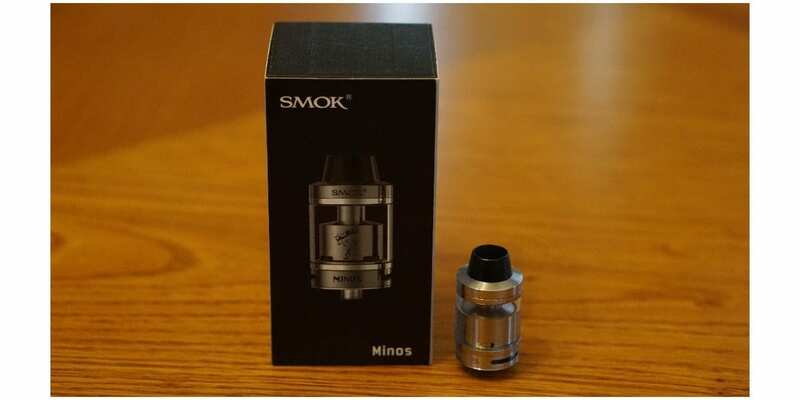 Like mentioned previously, the Smok Minos 25 Sub Tank does include an RBA or RTA section, which is the Minos M2 RTA Deck. Firstly, this RTA build deck does feature a 2 post velocity styled build deck, so this is a huge pro right away. To me, the velocity styled build deck is one of, if not the most easiest build deck to install and build coils on. Of course, this is preference, and you may find a different build deck to suit you better. Honestly, I do think that this build deck is really great for beginners. It is extremely easy to center your builds with this style deck. Also, installing the build deck in the Minos 25 is really simple. All you have to do is unscrew the pre-installed 0.3 ohm Minos Sub Ohm Core, and screw this deck section in. Also, the build deck is relatively large. Not large enough to fit exotic coil builds such as a staggered fused Clapton, but you can easily fit normal Clapton and smaller Fused Clapton builds with little to no issue. Now wicking it is may not be as simple as building on the Minos Q2 RTA Deck, especially if you are a beginner. The first time I wicked this tank, I did put too much cotton in the wicking channels. With the Minos M2 RTA Deck, you cannot stuff these channels with cotton, especially if you are using a high VG e-liquid. What I found to work best is to have cotton sitting right on top of the wicking channels. A small amount of cotton can be towards the bottom of the wicking channel, but not too much. Like with all other RTAs, finding a good balance of cotton is always key to wicking. Wicking the Minos M2 RTA Deck really isn’t that difficult, but like said before, you cannot stuff cotton into the wicking channels. You will certainly run into dry hit issues and it will not wick efficiently at all. However, if you wick it like how I mentioned, then you will not have any issues, and it will keep up easily with chain vaping. All in all, building and wicking the Minos M2 RTA deck is relatively easy, especially for the experienced user. However, if you are more of a beginner, you might find some difficulty with wicking. Practice makes perfect with wicking any RTA. Finding what works for you is always best. In the next section, I will go into the performance of the Smok Minos 25 Sub Tank! Firstly, I will go over the performance of the Smok Minos Q2 Sub Ohm Core. The resistance of this replacement coil head is 0.3 ohm. In addition, this coil head is rated between 30w and 80w. Even though this is the rating of the coil head, finding what wattage works for you best is key to a great vaping experience. When first vaping this tank with this coil head, the experience was really great. There was very minimal break in time, almost none really, which was a huge pro. I did use high VG e-juice in this tank when using this coil head, and it handled it just fine. My preferred wattage for this coil head was between 50w and 60w. The flavor was really good the first couple of days, definitely above average. I honestly was surprised how good the flavor was, especially seeing that many people dislike this specific coil head overall. At this wattage range, I would get a satisfying vape experience. The vapor production was also very good, and certainly satisfying. I did take the wattage up to its highest recommended, which is 80w, and found that it really could not handle this amount of wattage. This could have been, because of the e-liquid I was using, which was high VG, but still I would think it would have no issues keeping up. At higher wattages, you definitely cannot chain vape. If you do, you will definitely get a dry hit after a second vape. I was disappointed with this since it is rated at this amount of wattage. However, I was satisfied with 50w to 60w. Now, even though the first couple of days with this coil head was great, after midway into the third day of vaping, I noticed I would get a burnt taste at the wattage mentioned previously. Since I was having this issue, I really did not want to take the wattage higher, so I ended up lowering the wattage to about 45w to 50w. In the next day, the coil would just taste burnt. I have no idea why this coil pretty much got worn out completely after a couple days of use. This is probably why vapers do not like this coil head. Like said before, the initial vaping experience with the Minos Q2 Sub Ohm Core was really good, actually impressive. However, after a couple of days it all went downhill, fast. This is certainly a huge con for me. Since they did not include an extra replacement coil head with this tank, I could not say if it was this specific coil that was bad, but honestly I doubt it since the coil was vaping great at the start. Thankfully, they do include the Minos M2 RTA Deck, which I is what I will get into next. My preferred coil build for this deck is a dual Clapon coil build. The coils consisted of 24GA Kanthal wrapped over with 36GA Kanthal. The resistance of this specific build was about 0.33 ohm. Vaping on the Minos M2 RTA Deck was a completely different, and much better experience than the Minos Q2 Sub Ohm Core. With the specific coil build mentioned, I would vape it around 55w to 70w. At this wattage, I got a nice and warm vape, which was certainly satisfying. Once wicked properly, this RTA deck keeps up with no issues, and I was using the exact same high VG e-liquid so I could compare it fairly. The flavor was just as good, if not better than the replacement coil head. Also, the vapor production was much better as well. With being so disappointed in the replacement coil head, the Minos M2 RTA Deck really brought this tank back to life for me. I was worried that it might not vape great since being disappointed with the replacement coil head, but I was surely wrong. I did not really notice any difference with airflow with both of these options. With the RTA deck section, you might get a very minimal increase, but honestly the difference was not noticeable in my opinion. Speaking about airflow, this tank has tons of it! I would close it off about a quarter way leaving it three quarters opened, and it would provide me with a nice airy yet slightly restrictive draw. When the airflow is wide open, it surely is airy. There is a very slight restriction when fully open though, giving it a great draw as well. The airflow is done really well, and was satisfied with it. Sometimes, there is just too much airflow with subohm tanks, at least for me, but this tank had the right amount to fit what most vapers want when adjusted or wide open. In addition, filling this tank is really easy. The threads are really smooth, and comes off with ease. Not to mention, the fill holes are really large, so you do not have to worry about what kind of e-liquid bottle you are using. 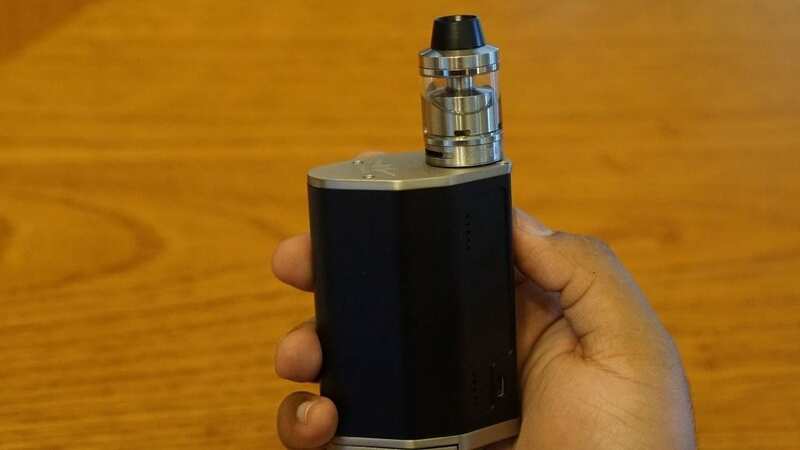 This tank can go through e-liquid quite fast, especially if you’re chain vaping at higher wattages. However, this is to be expected with any subohm tank or RTA. so this is not really a con, but still worth mentioning. It does have a 4ml e-liquid capacity, so you will not be filling too often either. I do think for its rather compact size, 4ml of e-liquid storage is great. Also when using either the Minos Q2 Sub Ohm Core or the Minos M2 RTA Deck I experienced no leaking issues. In addition, there was very minimal spit back with either option, which are two huge pros. However, for some reason e-liquid would appear around the airflow control. I have no idea why or how this e-liquid gets there, but it does happen quite often. There are some other subohm tanks or RTAs that have this same issue, and I still have no idea why this happens. If you have knowledge on this issue and a possible solution, feel free to let us know in the comments section! The amount of e-liquid that would appear around the airflow control is very minimal, but is noticeable. The e-liquid does not pour out of the airflow holes, so it is not the biggest con, but still is worth mentioning. 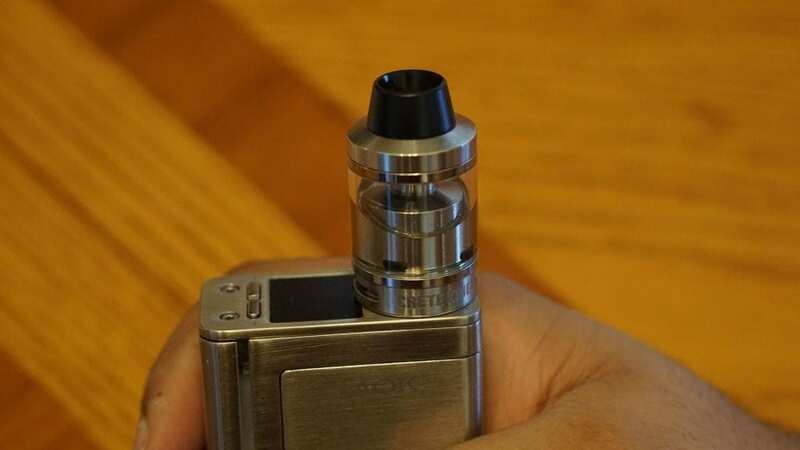 Another issue that I would run into when vaping this tank is that when I would adjust the airflow, it would also adjust the juice flow control. It is a huge pro it does have juice flow control, but this is certainly a con as this was very annoying to deal with. This would happen quite frequently too. In addition, the delrin drip tip is very comfortable to use. I would normally use different style drip tips, or sometimes custom 510 drip tips, but since this was so comfortable to use, I did not mind it whatsoever. Overall, the performance of the Smok Minos 25 Sub Tank was solid, especially with the included Minos M2 RTA Deck. However, there are some cons to mention with this atomizer, which is what we will get into next! The first con to be mentioned is the Minos Q2 Sub Ohm Core replacement coil head. Like said previously, the initial vape experience in the first couple days was excellent. However, after the second day, everything just went downhill. I have no idea why this coil head did not last long at all. Having only 4 days out of a replacement coil head is just terrible. 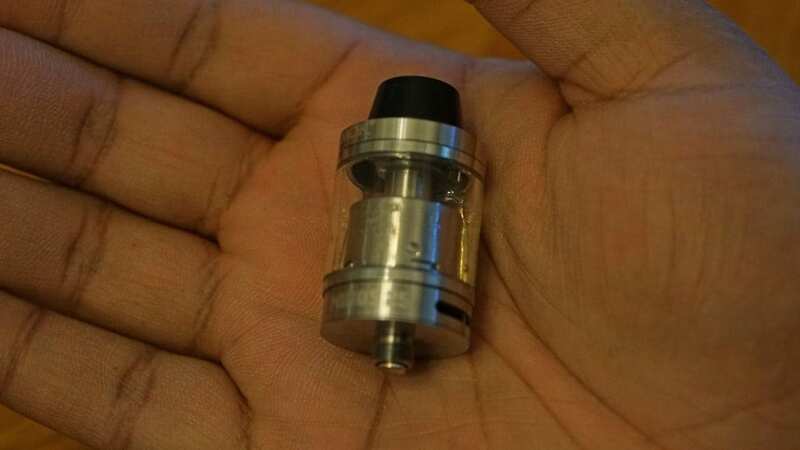 It is another con that this tank only included 1 replacement coil head, as I would have loved to see 2 plus the RTA deck section. However, as said before, I can see why they do not. It is still worth mentioning though. The next con to be mentioned is that there would be e-liquid that would accumulate around the airflow control. 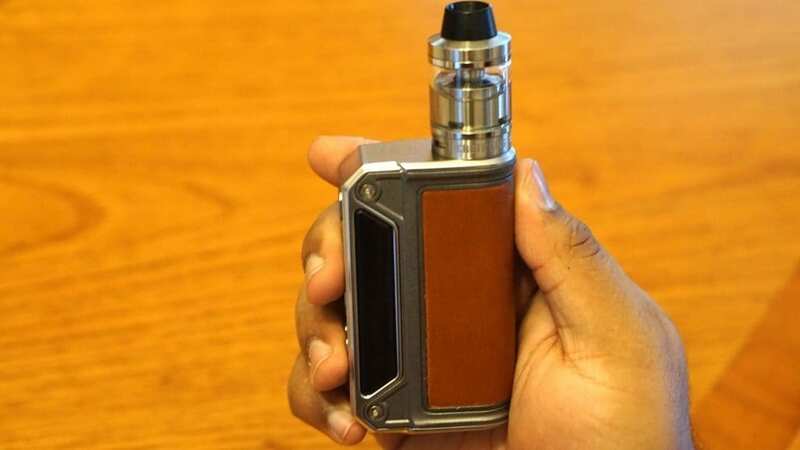 This tank never leaked on me, but this e-liquid that would appear is quite annoying as I found myself constantly wiping the airflow section with a tissue or cloth. Another con is that when I would adjust the airflow, it would adjust the juice control control as well. This was really annoying, and probably more annoying to deal with than the last con mentioned. I have no idea why this tank would do this. However, tightening down everything very tight did help somewhat, but still I think the juice flow control is just too loose. The next con is not the biggest con, but I could not get the included drip tip off. It does state on the Smok website that it is indeed a 510 drip tip, and is removable, but I literally could not get it off. This was not a huge con for me as I do like the included delrin drip tip. Overall, there is not too many cons for this tank, but some may be deal breaking for you. However, the overall performance of this tank with the included RTA section is solid, which leads me into the next section, my conclusion! In conclusion, the Smok Minos 25 Sub Tank is a great performing tank, especially with its Minos M2 RTA Deck. I do think this tank got shadowed, and not many people know of it due to the amount of tanks that have come out recently. In addition, other tanks are just so much more popular, which made this tank just go under the radar and overlooked. I really am impressed with its design, and overall looks! I personally love the way this tank looks on almost all of my box mods, especially my larger devices. I do like compact subohm tanks, and with its 25mm diameter, it just looks great. Not to mention, the price on this tank is excellent, generally costing under $25! Many large subohm tanks are tall, and just look large which some people may like or prefer. However, others may prefer something more compact like this. Do keep in mind it is 25mm, so with smaller box mods it may not look too great, but with most devices it does. The Smok Minos 25 does have plenty of available airflow, so it easily caters to cloud chasers. However, closing off the airflow just a tad bit gave it more of a restrictive lung hit, improving upon the flavor while still providing excellent vapor production. The overall flavor is just excellent, especially with the Minos M2 RTA Deck. The Minos Q2 Sub Ohm Core did perform quite well, but sadly it went downhill quickly after only a couple days of use. This is a major con to this tank, and I do wish the coil heads just lasted longer. Hopefully this review helps you with picking your next tank! Feel free to leave any questions or comments down below! Thanks for reading, and be on the lookout for our next review! Minos was the King of Crete in Greek mythology. He later became the judge of the underworldz after his death. Thanks for letting me know! Definitely appreciated! Thanks for the review. Been looking at picking up a new tank, but with the recent boom, it’s hard to figure out which one I should go with. You’re welcome! Thanks for reading! I definitely agree, there’s a ton of tanks to choose from now than ever before, so hopefully this review and others will help you make that decision. Thankfully some of them aren’t too expensive, so it makes it a bit easier to make the decision as well. I do enjoy the Smok Minos 25mm though, it’s certainly a great tank with excellent flavor and vapor production.